Readers who tenaciously seek silence in their PC will probably recognize the Thermalright Ultra 120. 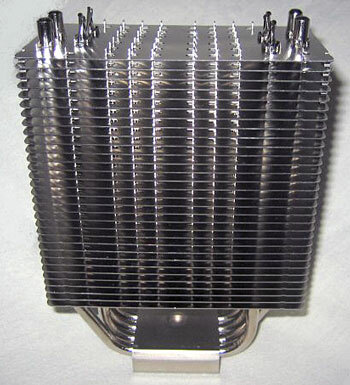 It is not exactly the same heatsink, but it is similar in appearance to the HR-01 fanless cooler introduced by Thermalright in late 2005. That cooler shipped for AMD only, as we were still in the hot Intel Prescott days. 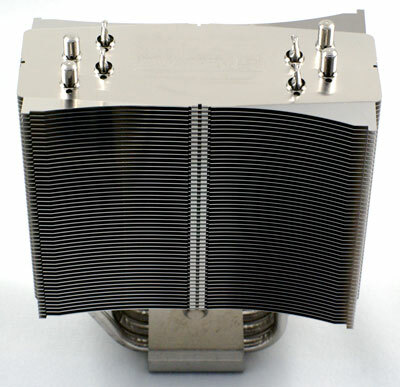 Adapters were introduced later to allow HR-01 to mount on newer sockets, and HR-01 is still in the Thermalright product line as a fanless cooler. However, there is no way to even mount a fan on the early versions of HR-01, so its appeal was limited to users seeking silence at around stock speeds. Overclockers really had little use for the HR-01. Thermalright recognized that a cooler designed to perform well with no fan could be very attractive to overclockers if there were some means of active cooling, and so the Ultra 120 was born. The Thermalright Ultra 120 refines the shape of the HR-01 and adds the ability to mount a 120mm fan to the heatsink tower. If you look closely you can see that the cooling fin edges are turned up on one end and turned down at the other end of the same fin. This creates airflow patterns that are refined in subtle ways from the more common flat fins. Unlike the HR-01 the Ultra 120 is designed to operate with a 120mm fan. The heritage, however, is the fanless HR-01 design, and we will also evaluate the Thermalright Ultra 120 as a fanless design. Since no fan comes in the Ultra 120 kit the buyer is free to select the fan that best serves their needs. This is something of a "gotcha" in the Ultra 120 design because the fan wires are designed to clip into the lower holes on a 120mm fan post. The problem with this design is that fans with a full post, which are most of the fans available in the lab, will not mount on the Ultra 120. You have to use a fan with holes instead of a full post. Fortunately two of the better fans that are available, the Noctua and the Scythe S-Flex, both use the 4-hole design. There are also some advantages to the fan clip design. Since the wire clips on the bottom of the fan you can use a 120mm fan of any thickness; You are not limited to 25mm. That is if you can find the fan in a postless design. The Noctua fans are an excellent choice for a silent PC. One of the available Noctua fans even has a noise rating of 8dB-A. Since our goal was maximum overclocking along with reasonable quiet the Scythe S-Flex was chosen in the highest RPM version that was available. This was the 1600rpm, 63.7 CFM SFF21F. The S-Flex uses the Sony Fluid Dynamic Bearing design for the fan motor instead of ball bearings or sleeve bearings. The Sony FDB should translate into a quiet fan, even at higher speeds, and it has a very long fan life. Scythe specifies the fan life as an incredible 150,000 hours. Even with the high CFM rating the Scythe SFF21F is still rated at a quiet 28dB-A, which is well below the noise floor of our test system's power supply. The Thermalright Ultra 120 and Scythe S-Flex SFF21F were both provided for review by Frozen CPU. This means both items are straight off the retail shelf. The advantage of using after market fans is you can choose the fan based on your system goals - silence, overclocking, or a combination of both. The disadvantage, of course, is that you need to buy a fan to go with your heatsink, where complete kit designs have a fan that is matched by the manufacturer to the heatsink. Both approaches can be argued, but the fan is a cost in addition to the heatsink cost. 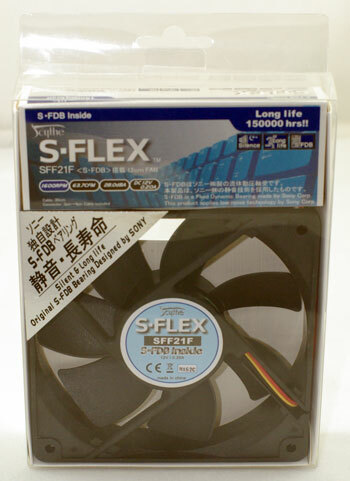 120mm fans can cost as little as $3, but the S-Flex was about $15 and the Noctua fans sell for as much as $25. With the Thermalright Ultra 120 and Scythe S-Flex combo there are several questions to be answered in our tests. Does the Ultra 120 live up to its billing by many users as the best heatsink you can buy? How does the Ultra 120 compare in overclocking abilities to the best heatsink towers tested at AnandTech? Since it is based on a fanless design, can the Ultra 120 be used as a fanless and zero noise CPU cooler? I would like to know what you have enabled or disabled in the bios that controls CPU automatic throttling. Typically that would include Enhanced C1 control (C1E), SpeedStep, and for my Asus MB, something called CPU internal thermal control. These settings affect how the cpu "handles" load and will affect the temps reported to the Ntune program. Programs like CpuZ and Coretemp and Ntune do not detect some of these rapid throttling instances, but the temps of the processor are reduced because of this throttling. The Righmtark CPU temp utility is one of the few programs I know that allows you to visualize this throttling even when you have several of the throttling paramters disabled. This issue is important because the temps you are seeing, even at idle, are very different for several of your reviewed heatsinks then what end users will experience when they have altered these parameters in the bios. I believe this will be helpful for end users to feel like the products your reviews are deeming as superior are performing in their hands in a manner similar to your review. Please provide the bios settings to help the end users decide if the equipment they have purchased is functioning properly. I suspect by doing this, many RMAs and emails to the manufacturer would be reduced. There is a clear 10C difference between the reported CPU temps at both idle and full load for my QX6700 cpu caused by changing these three settings. Enabling these parameters in the bios I routinely see temps of 33 to 35 C for the cores of my QX6700 at stock speeds, MB temp is 35C. Disabling these parameters, temps on all 4 cores rise to 44C. Thus discrepancy in temps could lead someone to think that the Monsoon II lite cooler I am using is malfunctioning, when in reality it is working properly. Also it would be helpful if you also tested these devices with the quad core processors which have a higher heat output. By testing the quad core cpus the high end capacity of these heat sinks to move heat would be tested. Providing the thermal resistance Degrees C/Watt would also be a helpful guideling for these devices. It would also be helpful to comment whether the side door will fit with the thermalright heat sinks. 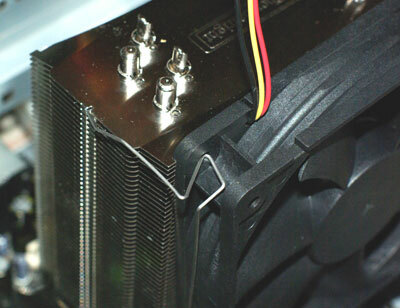 As far as I know this heat sink is taller than the Tuniq which caused end users to move side panel fans and vents. I think you should consider retesting the Monsoon II Lite. As the only heatsink to make it to 3.96ghz on your OC tests, and with a full 6C increase in temp at 3.90ghz compared to the Ultra 120, I question whether you can replicate your results with the Monsoon at this point. We all know transistors age with OC'ing, and it is possible that your CPU has actually degraded in performance since you tested it with the Monsoon. Sorry my fault I mis-stated the temp difference at 3.90ghz between the two heatsinks, it is actually a paltry 2C! This is a decent review of the Ultra 120 Wesley, good job. But like another person posted, I also had gotten an Ultra 120 with a bad base finish. In my case, there was a machining ridge left on one side of the base that interfered with getting a flush mount plus the base was fairly concave too. And my initial testing of it (with those defects) found the performance to be no better than the stock Intel heatsink. After I filed the ridge down on the edge, then lapped the base of the Ultra 120 to be flat, the performance was much like the performance that you had with yours. I also tested it with both the S-Flex fan you chose plus I tried the Tuniq Tower's fan too(I also have one of those heatsinks) and saw very little difference in cooling ability with either fan mounted on either heatsink. So for the folks that want to swap out the Tuniq Tower's stock fan with the 63 cfm S-Flex you will only lose a minimal amount of performance and the S-Flex is noticeably quieter. Also in testing my Ultra 120, I tested on a socket 939 AMD system too and ran into a mounting orientation problem with my motherboard. Since AMD doesn't use a square mounting pattern on socket 939 (or 754 or 940 or AM2 for that matter), you can't just change the mounting direction by simply rotating the heatsink 90 degrees. Thermalright does make an "S" clip for this though, which I also tried out. The "S" clip is a real PITA to mount with but does do the job effectively and gives you a decent mount. Finally, with the Ultra 120 you have the ability to mount different thickness fans too, unlike the Tuniq Tower. You can easily use any of the Panaflo 120 X 38 mm fans and if you are brave enough you can even mount the Delta GFB1212VHW 120 X 76 mm fan if you think it would help in cooling (I don't think so as there seems to be a point of diminishing returns on added cooling efficiency with this heatsink past 60-70 cfm with a moderate max static pressure fan). The biggest problem I see with Thermalright's products lately is the somewhat variable nature of their quality control on base finish. I've also gotten some XP90's in the last year or so with concave base finishes that required lapping too. But other than that, Thermalright has some of the best designs on the market in my opinion. I have been having good success with the HR-01 from Thermalright, so I am glad to see this review which more accurately measures the performance of *this* heatsink versus competitors, which looks even better than the HR-01 in terms of construction quality (the HR-01, despite its good performance, looks unfinished). As far as the stock Intel coolers go, I have been pleasantly surprised by the latest generation of both Intel and AMD stock coolers. Though I recently replaced a customer's late model P4 stock heatsink (LG775 3.04 Prescott) with an HR-01 with Scythe SFF21F because of crazy temps that were causing the system to power down. Tried adjusting the heatsink, and when cleaning and reapplying thermal paste to the stock cooler I noticed that as opposed to the copper core of the C2D coolers, this had a chrome-like metal. After reinstallation, the temperature at idle was still crazy hot, with no apparent reason (Intel board, voltages looked OK, no overclocking, etc.. After installing the HR-01, idle dropped to 32C, full load after 20 minutes was 47C-49C. Awesome review, I love the amount of detail and variables involved in the test, very comprehensive and well described. I was set on a Tuniq but after being frustrated by how hard they are to get in Canada, I am going to go with an Ultra 120 instead. My current PC (4 year old P4 2.6 Northwood @ 3.25) has been cooled with a Thermalright SLK-900U (copper) and has been stablewith a 625MHz OC for 4 years. I like the company. Anyone know if there are any fit issues using the Ultra 120 with a Asus P5B-E in an Antec P180B/P182 case? Nice article but all it has convinced me is that the intel stock cooler is surprisingly pretty good for "free"
I know you specified in your article that an adaptor for AM2 needs to be purchased separately but I don't find this quite normal. I think Thermalright should make an effort and support AM2 out of the box. After all AM2 isn't a new thing , it's been out for quite some time now and it's also here to stay. An extra adaptor costs more and might also be hard to find. Are you sure you're describing that correctly? I don't ever recall seeing such a power supply, unless someone screwed up and installed the fan backwards. I agree though that a power supply with a bottom fan would be better suited to cool a fanless heatsink, but because it draws in air FROM the CPU area not blows ONTO the cpu area.